With the digitalization of enterprise business, sales people needs to be more agile than ever to be successful in a highly competitive environment. However, they find it time-consuming to identify potential issues and thus cannot react quickly. The enterprise system has evolved from a transactional system to a digital system, which provides enterprise with information, live data, and analytics. And that’s not all, the vision for the future enterprise is transforming to an automated and even autonomous system, which is known as Intelligent Enterprise or Self-Driving Enterprise equipped with a self-learning enterprise system. How can SAP contribute to that vision? 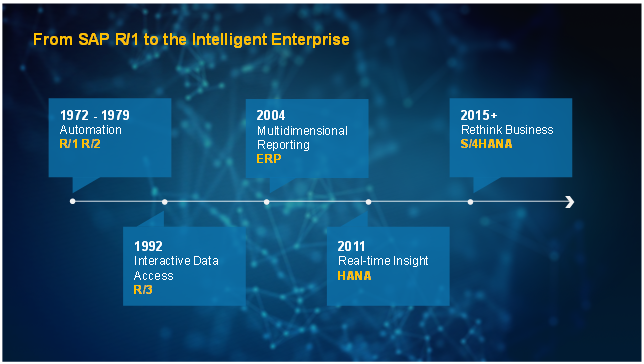 Since 1970’s, SAP has delivered enterprise systems R1, R2, R3. After rethinking the business, SAP presents SAP S/4HANA that leverages the power of intelligence. You could get more insights by looking at the Keynote speech from Dr. Hasso Platter on SAPPHIRE 2018. SAP S/4HANA Sales contains analytical applications that enable you to monitor and analyze your data. The embedded real-time Sales Monitoring and Analytics offers a full coverage of monitoring and analytical features across all core sales processes. It provides top-class performance by leveraging CDS views and SAP HANA capabilities based on an adapted OLTP data model. Embedded Analytics will relieve the sales people from repeated manual tasks, for example, instead of having to run multiple reports to triangulate the performance of his team, it would be possible to see a real-time performance by product, customer, by month in a single place in SAP S/4HANA Sales. With the Embedded Analytics and Machine Learning capabilities in Intelligent Enterprise, Embedded Predictive Analytics is possible. Sales people don’t have to spend hours every week on numerous spreadsheets to predict the future. Let’s take two examples to illustrate how the embedded predictive analytics works. You can use Quotation Conversion Rates to track to what extent your quotations are being converted to sales orders before expiring. By leveraging machine learning capabilities, you can gain predictive insights into quotation conversion by comparing actual and predicted results. With precise predictions, customers can focus more on what’s value-generating. With big data explosion and the machine learning capabilities, the system helps forecast if sales targets could be met or exceeded and propose proper follow-up actions. With this app, you can compare your currently achieved sales (for example, sales volume) with predictions which are based on predictive modeling. By selecting an existing sales plan(Getting Started with Manage Sales Plans), you can analyze to what extent your sales targets are being achieved. Using this app, you can gain predictive insights into your current sales performance. Let’s see how Intelligent ERP Makes a Difference to Sales People in a small story. For more information, see SAP Help Documents. Should you have any questions, please leave a comment below or send me a message. Thank you. Demo Video contrast is very bad. Demo contents gives a good insight on system capabilities. This is greatly appreciated.